Motorola has announced that the Motorola One Power will be launched in India on September 24th, 2018. The official Motorola India Twitter handle has revealed that the Android One-powered device will arrive in India later this month. The Motorola One Power, which was unveiled alongside the Motorola One at IFA 2018 last month, runs Android One out of the box and packs some impressive hardware in a sleek build. The device features a 6.2-inch Full-HD+ IPS LCD display with a 19:9 aspect ratio and a wide notch. The Motorola One Power features an octa-core Qualcomm Snapdragon 636 SoC clocked at 1.8GHz, which is coupled with up to 4 gigs of RAM and 64GB of internal storage which is expandable up to 256GB. The device packs a dual rear camera set-up consisting of a 16MP primary sensor and a secondary 5MP sensor, while there is an 8MP sensor up front with a f/2.2 aperture to take care of selfies. The device packs a 5,000mAh battery with support for the TurboPower charging technology and is claimed to provide a battery back-up of over 6 hours on a single charge. The Motorola One Power runs on Android One based on Android 8.1 Oreo, however, Motorola has assured that the device will receive the Android 9 Pie update. The Motorola One Power is available in two variants, one with 3GB of RAM and 32GB of internal storage, while the higher-end model packs 4GB of RAM coupled with 64GB of storage. Motorola is yet to reveal the pricing of the Motorola One Power, but given the $349 (approximately Rs. 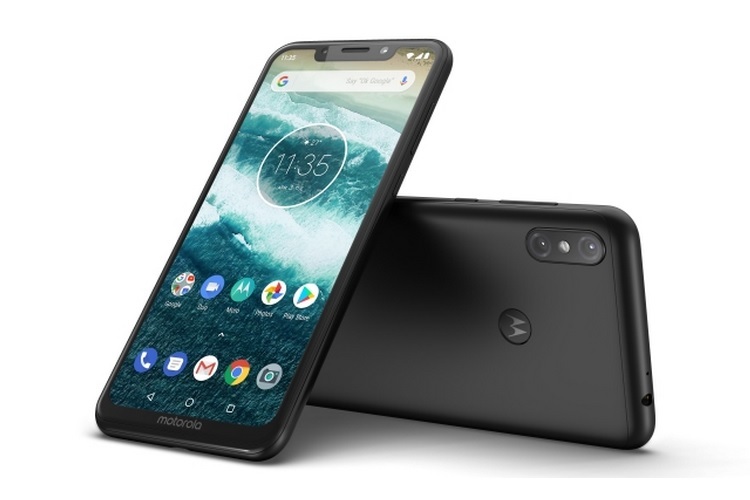 25,400) price tag of the Motorola One, we can safely assume that the device will be priced above the Rs. 25,000 mark upon its launch in India.